You are listening to "Entertainer"
In the midst of the Ozark Mountains, we find Branson, Missouri. 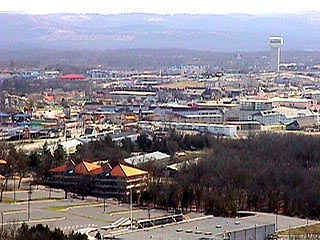 Branson has a permanent population of only 3,740, but nearly six million people from all over the world visit each year. More live entertainment theatres are located in Branson than anywhere else in the United States. It has been called, "everybody's hometown." At night, Branson has been called "a nice Las Vegas." Many country music stars have built theatres here and Branson is rivaling Nashville, Tennessee as the country music capital of the world. 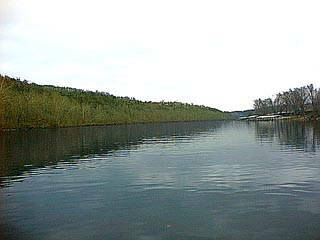 The Branson area is so rich in natural forest and mountain land, it's perfect for hiking, camping, fishing and boating. There are three lovely lakes in the Branson area. Isn't this a perfect fishing hole. This is an arm of Lake Taneycomo. Looks like a nice day for a boat ride. This is Table Rock Lake. 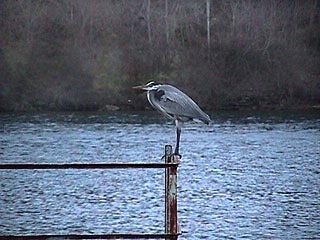 Standing guard at Bull Shoals Lake. Everyone get comfortable because we're saying goodbye to Branson and heading for Independence, Missouri. It's a bit of a ride so, if you're tired, this would be a good chance to catch a nap. We'll wake you when we get there. WAKE UP EVERYONE. WE'RE HERE! Independence was the home of our 33rd President, Harry S. Truman (by the way, did you know the "S" didn't stand for anything. He didn't have a middle name.) 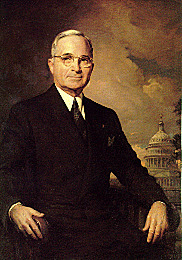 Truman was President from 1945 until 1953. Truman's nickname was "Give 'em hell, Harry," and that he did. He kept a sign on his desk which said "The Buck Stops Here." 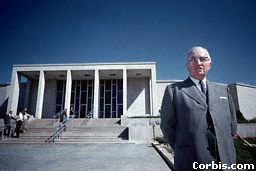 This is the Truman Presidential Library and Museum. The Library has something unique. When the library was built, it included an exact replica of the President's Oval Office in the White House. 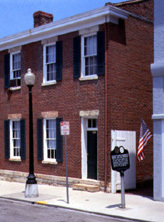 This is the Truman house in Independence. If you're ready, we'll see some other architecture in Independence. This is the Bingham-Waggoner Estate. Built in 1865, this home was once owned by George C. Bingham, famed Civil War artist. Here is the 2-story Jackson County Jail. Built in 1859, it once housed Frank James, notorious brother of Jesse James. Last stop on our tour is the Vaile Mansion. Built in 1881 by entrepreneur Harvey Merrick Vaile, this ornate 30-room mansion is one of the finest examples of Second-Empire Victorian architecture in the country. Well, that's it folks. We certainly hope you have enjoyed your tour of our beautiful Missouri - where the rivers run. This tour presented by Helen and Robert.